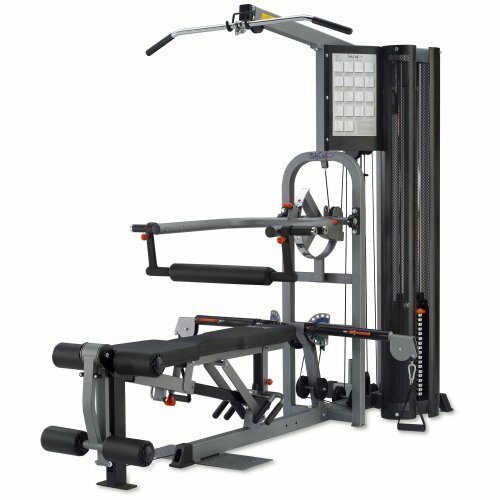 The K1 Strength Training System is well suited for strength training, functional core training, sports specific and other rehabilitation exercises. Every possible traditional dumbbell and Barbell exercises can be performed with this home gym. Its weight ranges from 5 pounds to 400 pounds. Frame: Heavy gauge steel tubing. Upholstery: Double-stitched heavy gauge vinyl covering contoured, extremely-dense foam. Weight Plates: 1-1/4 thick precision milled with EZ Glide nylon bushings. Pulleys: 4-1/2 diameter, fiberglass reinforced nylon and rotate on sealed ball bearing hub. Cables: Internally lubricated, 7 X 19 strand construction, rated at 2000 pound tensile strength. Press Arm easily adjusts to any desired starting point. Folds out of the way for dumbbell training. Double-Up Cables convert the resistance ratio to 2:1. This provides for Presses and Squats with up to 400 pounds resistance. Adjustable Cable Arms provide for a complete array of dumbbell exercises, sports specific exercises, and rehab exercises. 200-pound weight stack, shrouds and mounted exercise charts included! Easy-to-adjust bench provides all angles from decline, to flat, to incline, to vertical. Leg Station easily adjusts to three different positions providing for Leg Extensions, Leg Curls, and a 45 degree position for knee-hold-down. *Note: Most of the sites, stores or shopping portals listed above sell BodyCraft K1 Strength Training System with discounts and other exciting offers. There is a possibility that the some of above websites are not selling BodyCraft K1 Strength Training System now. Toughtrain.com is not liable for such cases or instances. Also we do not recommend any seller for BodyCraft K1 Strength Training System and a buyer should buy from where he/she gets best deal with quality of products, service and on time delivery (shipment).